Using leftovers is a great way to save money, reduce food wastage and respect the lives of the animals that have been killed for our benefit. It has been claimed recently that Britons throw away over £8 billion worth of food each year. The knock-on affects of this touch many issues - household food budgets, intensive farming, supermarket responsibility, the environment and increasing obesity. Studies show that for every three bags of shopping bought in the UK, one will end up in landfill. This is terrible on many levels - landfill sites are already over flowing, global food distribution is uneven, the growing debt of many Britons could be helped by better household management and the profits of large supermarket chains are growing disproportionately to the buoyancy of the independent British high street. Rather than going to the supermarket on an empty stomach and buying whatever takes your fancy, how about preparing a meal plan, either for the week or just the next couple of days and just buying what you need - ideally locally. You can then plan your meals by incorporating leftovers. Sunday - Roast chicken, roast potatoes and vegetables. After enjoying your roast dinner, make sure you cover and refrigerate the bird and put all the vegetables together in one saucepan. It will be easier tomorrow if you try to keep the vegetables and potatoes 'separate' in the pan, although putting them together allows you to wash up the other saucepans and dishes. Monday - Bubble and Squeak. If you have plenty of vegetables left, you can make the classic British supper of Bubble and Squeak. Using a large frying pan, fry together your vegetables and chicken with plenty of seasoning and even a little gravy if you have some left. It works best if you cook the potatoes first - roast potatoes can be chopped up for quicker cooking. Tuesday - Chicken Curry. If you have bought a decent sized bird, there will still be enough meat left to make a curry - especially if you bulk it out with some vegetables or lentils. Start by frying together plenty of chopped garlic, chilli and ginger in a little oil, add spices, a tin of chopped tomatoes and some water. 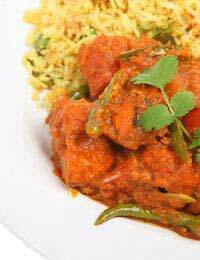 Add your chicken and serve with basmati rice. Wednesday - Soup. You can make a delicious base for soup using the chicken carcass. In a large pan, cover with water, add onions, carrots, peppercorns and a bay leaf and simmer for as long as you have. After straining, you can add your choice of vegetables and potatoes - leeks work well, as do grated carrots and plenty of coriander. Thursday - Spaghetti Bolognaise. By making a good meat ragu sauce this evening, your supper tomorrow will only take a few minutes. Take some good quality minced beef and cook with garlic, onions and tomatoes. A dash of red wine and some oregano give an authentic flavour. Cook this down for at least an hour and serve with al dente spaghetti and plenty of grated parmesan. Friday - Chilli. Using the leftover bolognaise, add in a tin of kidney beans and a teaspoon or so of chilli powder. You can even add in a tin of baked beans if you don't have much sauce left - it works! This chilli is delicious with rice, good bread or over tortilla chips. Serve with grated cheese, guacamole and sour cream. Saturday night is perfect for treating yourself to something special - perhaps a piece of fresh fish. If you plan for menu for the week not only will you save yourself time and stress at the supermarket, but you can also get an overview of the number of portions of fruits and vegetables that you eat. There is no need to throw away food you have prepared is you make your meals with an understanding of how to make a delicious meal from your leftovers.